The release of Samsung Galaxy S5 is the news around the corner now. Samsung is fully set to release its recent addition to its most hyped “S” series phones. 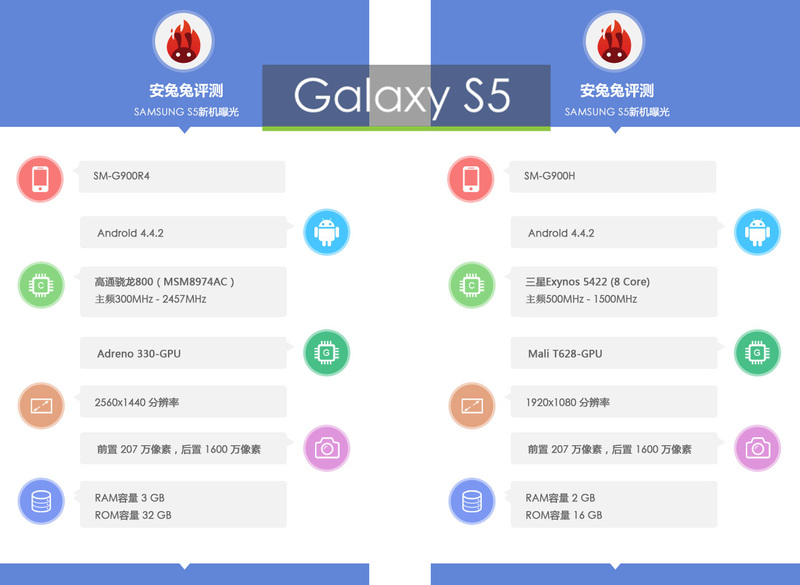 Following Apple’s footsteps they are most likely releasing two variants of S5; a premium version and a standard version. The premium variant SM-G900R4 when tested on Antutu got a benchmark score of 31,843 points. It houses a Quad-core Qualcomm Snapdragon 800 (MSM8974AC) SoC with a clock speed of 2.5GHz, Adreno 330 GPU, 3GB RAM, 32GB of internal storage, QHD (2560×1400) resolution display, 16-megapixel main camera sensor, 2.1-megapixel front facing camera. The standard variant SM-G900H got a benchmark score of 35,445 points. It houses an Octa-core Samsung Exynos 5422 SoC with a clock speed of 1.5GHz, ARM Mali-T628 GPU, 2GB RAM, 16GB of internal storage, Full HD (1920×1080) resolution display, 16-megapixel main camera sensor, 2.1-megapixel front facing camera. There is a significant difference in the benchmark score of the two variant. The standard one scored better than the premium which might catch the eyes of many. It does not actually mean that the premium version is less powerful than the other, but rather it’s because of higher display resolution (QHD) in the premium that eats away the power, thus scoring worse in the benchmark when compared which houses a standard Full HD resolution display. These two variants are significantly different from each other in terms of specs. It might be a good news for the consumers as the standard version would be a bit more affordable for the consumers but won’t be lagging behind in terms of performance. For Samsung it is a big gamble, the standard variant might turn out to be a failed project like the 5C, or it might turn out to be a market spinner. Let’s take this information lightly as it hasn’t been confirmed by Samsung yet. Samsung will be holding an event in the last week of February where they might be unveiling the much-talked about Galaxy S5. Till now we haven’t seen any leaks of the pictures of Galaxy S5. A video preview of Galaxy S4 was posted online months before its release. Seems like Samsung has learnt a lesson and now knows how to keep a secret!